The Aqua-Pure AP-117 Premium Chlorine Taste & Odor Filter reduces chlorine taste & odor, dirt, sand, sediment, and rust particles in your water. 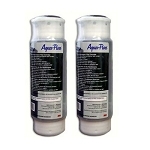 This Aqua Pure AP117 filter is ideal for cleaner, better tasting water. The Aqua-Pure AP117 can be used in Aqua-Pure AP11, AP11T, AP101, AP101T, AP12, AP12T, AP2610, AP1610, AP51Tm and any other filter system that calls for a standard size (9 3/4" X 2 5/8") small diameter 5 micron filter such as Ametek, American Plumber, GE, Pollenex, Sears, and WaterPik. 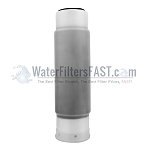 This versatility makes the Aqua Pure AP117 an ideal filter choice. The Aqua Pure AP117 will not work in the Waterpik K50 / K-50 systems. The Aqua Pure AP117 is also a direct replacement for the Whirlpool WHCF-GAC cartridge and WHKF-GAC. The Aqua-Pure AP117 Premium Chlorine Taste & Odor Filter reduces chlorine, dirt, rust and sand sediment and rust particles from your water. A: Exact replacement for Cuno Aqua Pure filter at a lower cost than manufacturer.